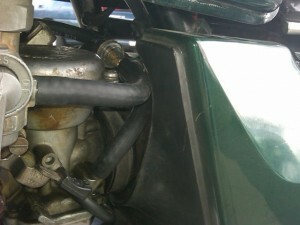 I get asked about installation of replacement fuel lines and filters on the KZ750 Twins alot. Such a simple thing, but the topic has many fine points, and I wanted to provide as much detail as possible about my preferred method of installation. I know many people like clear fuel lines because you can see through them for troubleshooting fuel flow; I even used to like them for the same reason. But now I never use them because over time they get hard and brittle, and easily loose their seal when jostled, sometimes at the side of the road, sometimes just while riding. Even if you take the extra insurance step to use mini clamps, the seal can fail in time. On the other hand, if you use a reputable brand rubber fuel line you will not have these problems, and you won’t need clamps. I change my fuel lines and filters every year when I return the bikes to use for the riding season. But even if I lived in a year-round riding climate, I’d still change them yearly. It only costs about $10 to replace it all, and you don’t have to worry about clogged filters, rotting lines, etc. Never use paper-element fuel filters. It’s not a lawn mower. Plastic inline fuel filters get softened by fuel over time, and can bend to the point of restricting fuel flow if you’re not careful. So be careful. When the KZ750 was designed, apparently the engineers never thought we’d have to worry about fine rust particles in the tank or inline fuel filters to compensate. Silly engineers. 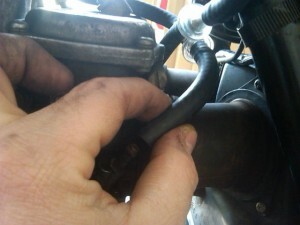 As a result, if you run without inline filters, installing fuel lines is an easy, intuitive breeze. However, since this is the real world, most of us do have to worry about rust, and we do have to use inline filters. And because of this, we have to do crazy, creative things in order to have room to accommodate the filters… and not cause them to bend and shut down fuel flow as they soften from extended contact with fuel… or melt from contact with the back of the engine. 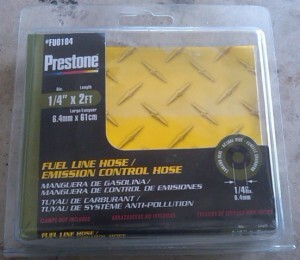 So, we start with one package of reasonable brand fuel line. 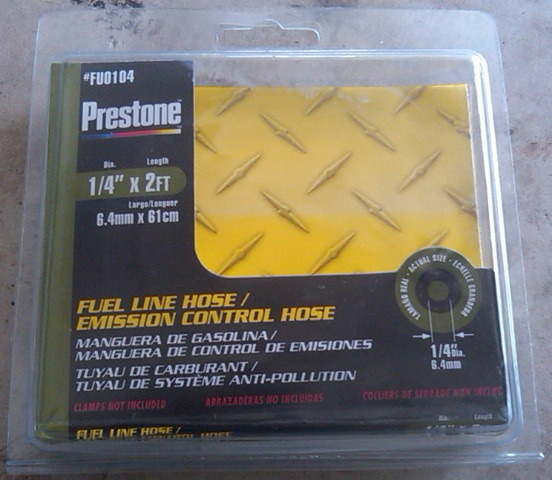 I’ve always used Good Year line in the past, but this time AutoZone had Prestone. Whatever, it’s 24 inches of 1/4 inch inner-diameter standard fuel line. As the design drawing above indicates, cut the line into four pieces as follows: 4″, 4.5″, 5″, and 10.5″ (or whatever is left). UPDATE, 2015: For the last couple years, I’ve actually modified the lengths a bit, and have been using 4″, 5″, 5″, and 9″ with great success. 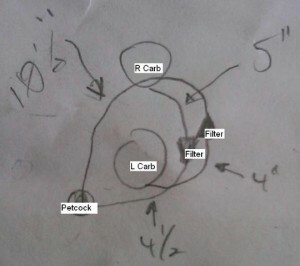 Assembly Step 1: Connect the right line to the right carb. I hope you have small hands, it’s tight in there. You may have noticed in the pics that I have the tank sitting up on a wooden block for space. Assembly Step 2: Complete the right line connection to the right output of the petcock. Assembly Step 3: Now feed the left side line assembly in from the right side, around the throttle cables and connect. Assembly Step 4: Finally, bring the line around and behind the other right side line, to connect to the left carb. One additional caveat though… If you use the original stock ’76 – ’78 side covers, you will have to cut away a bit of the cover to accommodate the fuel line running where it was not intended to be. But if you do it with a nice, smooth arc, it doesn’t look out of place. This is an excellent Idea I have been trying to figure out how to do this for a while. I just posted a question asking for this exact information. Thanks, Bique! Thank you for the advice. It worked and my bike is running better than ever. Please keep it up. 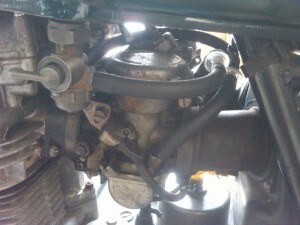 If at all possible I would like to learn how to inspect my jets on the carb. Thanks again. Lets discuss air filters: K & N produces an air filter, and UNI produces an air filter for the KZ750 B1-B4. I also see an air filter on e-bay that is a copy cat to K & N. What’s good and bad about any of them? That’s good fodder for a post, thanks for the suggestion. In the meantime, here’s my $0.02 about air filters for the B series. Really, I don’t use Seafoam to manually clean carbs, but Seafoam does wonders if you just introduce it to your regular fuel. Here’s what I mean – If you recently got a bike that is running, and are unsure of it’s origin; after doing the standard stuff (fresh gas, oil/filter change, etc), just add 1/2 of a small can of Seafoam to a full tank of fuel. In my experience, the bike will start to run poorly/rich in a day or two, since the previous owner likely was making carb adjustments to compensate for years of carbs clogging slowly… The Seafoam will eat away the gummed up fuel from the tiniest passages that you can’t get to without professional cleaning, and can get you by until then, if not completely cure problems. Good presentation. I do basically the same. 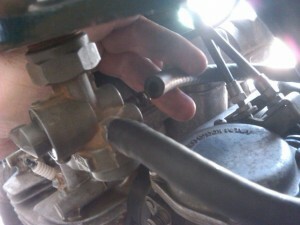 I learned the first time I did it that it is a good idea to “flush” some fuel from the “on” and “reserve” petcock positions in the tank into a container before hooking up the lines to the carbs. The first time I replaced the lines I noticed some rust particles and debris flowing into the new filters. So, flush before hooking up to the new lines. Good day. So I bought a 1976 750 and I need a carburetor. I cannot find one anywhere BS38, right? Anyone know where I can get one re-built or new? I just got an old 78 KZ750, I had it running when I picked it up but only with a jump. I’ve replaced the Battery but now it won’t start. Every time I try to start it I end up flooding the carb. It has this really “Mickey Mouse’d” Petcock on it that is leaking. The carb wells leak too; in fact if the petcock is on it all leaks nonstop and when it off it only leaks a little. So, I’ve determined to start with replacing the Petcock and fuel lines like you’ve posted. I’ve never worked on a bike fuel sys before. Where do I get a new Petcock? The only ones I see online don’t look like the one here, or one I can even mount, or they only have one outlet. How do I get one like the one you’ve pictured here? Salvage? As for a new petcock… I’m not sure you actually need one, because it sounds like you haven’t disassembled this one and looked into it… But the good news is that the “screw-on” type on our early KZ750s is exactly the same as on many Harleys and custom bikes, so you might be able to use one of them with a splitter or something. I might even try that myself some day, as I’ve already bought some of the parts needed. Thanks, for the advice. So far I’ve used your forum for a lot of helpful direction. Additionally I’m replacing the air box with two K&N clip-on air filters (K&N RC-0982) and removing the plastic and chrome fenders. I’m thinking I’ll just put them out on Craigs list unless you know someone who wants them…? Glad to help. By the way thanks for the questions, because they might make good subjects for tip pages some day. I’ve bought those carb kits in the past too. They should be fine. I wish they had the rubberized tips on the floats like many modern ones do (for a good seal), but they don’t. Other than that, I can’t complain. 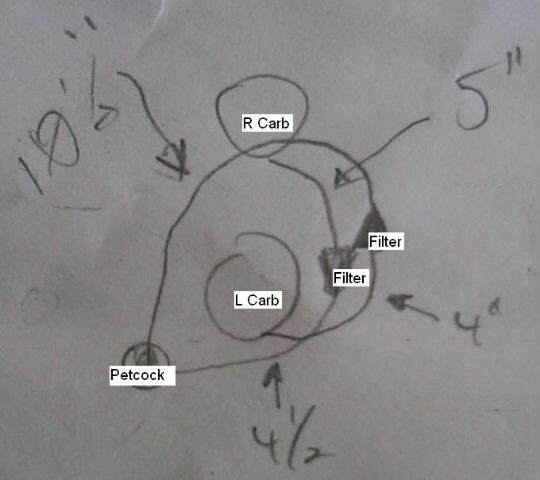 Regarding the pod filters… well, I’ll admit, I’m biased and I hate those things. So now that I warned you about my bias 😉 I’ll also tell you that you’ll probably need to run the floats a half millimeter to a millimeter high, and definitely get larger pilots and maybe mains. Heck, you pretty much need larger pilots just because the stock ones are too small outta the box, but there you go… And just be careful when balancing them, and you should be fine. I already have a mountain of parts, and I don’t know anyone who needs ’em, thanks though. You’re probably best served listing those things on eBay or Craigslist. Got a problem, there is a jet on the float well/bowl that I was extracting but it broke. I drilled and was using a makeshift extractor and it broke in it. Now I’m having that kind of trouble extracting whats left I a way would destroy the bowl itself. So, I figured I’d call a local Cycle Salvage guy and see what he could do. He offered to sell me the same kind for $200(no idea if it is rebuild or not). I’m thinking that I might take him up on it but I’d hate to have to spend money on something I already have not even knowing if it is in good condition. however, if I did then I’d have a carb to pull parts off if necessary and possibly a set of rebuild kits for the future… should I take the plunge in to that dark abyss of part hording or continue to press on the bowl in the vain hope that it will work out? Holy cow, don’t pay $200 for *anything* on these bikes! Except paint, I suppose. First, I don’t know why it broke while you were removing it, that’s a bummer. But you should just watch eBay for a replacement piece. Or post on the KZRider.com or Kawasaki Twins Owners Group forum. Post a picture of the part that broke. See if someone has one, etc. And be patient! Impatience costs lots of money…. Don’t worry I didn’t, I was way to put out about the cocky mater-o-fact attitude the salvage guy had. It made me not want to do business with him. I took the bowls to a motor-head friend who saved the day with his masterful skills of mechanics. It took him about 3 hours but he got it out without damaging the bowl; now I owe him a case of beer. Toast, hello, I have a quick question for you. what is the stock postion for the pilot screw on a 79 twin? I just rebuilt carbs but no where in the manual does it give this setting. Thank you for your time, Kevin. Actually, it *is* in the manual… I just checked and in page 14 of my older-style manual, under the “Adjustment” section, subsection “Idling Adjustment”, it explains to start by setting them a 1 1/2 turns from seated. It goes on to say that normally the final result will be within a half-turn from the specified setting. I run mine at 1 1/2 to 1 5/8 turns out from seated. Toast, thank you for your response. I don’t have my manual with me right now, its at work, but I will check page 14 for sure, but thank you for the info. Got another “situation” for you to ponder. I can’t get engine to start, but by what you just told me, I think I might ne flooding it, I have it set to 2.5 out from seating. Engine turns over, got spark, got New contactors and condensor, adjusted to specs as per manual, but engine will not fire. Any thoughts? Thank you very much for your time. Toast, by it, I mean pilot screw is 2.5 turns from s bottoming out, 1 full turn past manual prescribed setting. Thank you for your time. 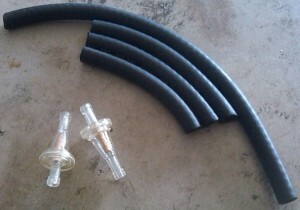 Clear fuel lines are good, but you need to buy the right material, not just any clear ‘fuel’ line. Visu brass cintered in line filters are good to put inline. ITW Fastex produces them in the USA. K&N filters are for racing applications, they do not filter very well in a street enviroment, avoid them like the plague. 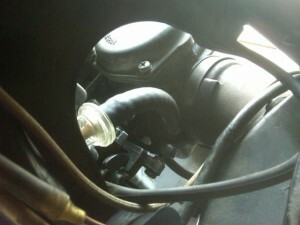 The best is the OEM paper stye units for prolonged engine life. my 2 cents, mc mech 20+ years…Came across your site looking for a rear master cylinder replacement….Viton is the company that makes the rubber tips on the fuel needles, the line should be the same material, the name escapes me at the moment…Todays fuel kills yesterdays rubber bits in the carbs, ethanol is the culprit. Hey thanks so much for going to the trouble to middle this. I just bought a 76 and this is extremely helpful! Thanks so much! I just did this to mine, super easy and well worth it. On a side note the 1980 kz750 twin I bought, the carbs didn’t have any vacuum lines…can anyone post a few pics of the lines on their carbs so I know where each line goes to and from? Thanks! Thanks for the info! I’m just getting into a KZ750-h that’s been sitting for years. I’ve cleaned the old fuel out of the very rusty tank and also disassembled the petcock. I can’t seem to find any part listing for the inner-tank fuel filter – do people just leave this part off and run inline filters instead? That’s what I do. An “H” model, eh…? I’m afraid I won’t be much help with the four-cylinder bikes, I’ve never had one… But thanks, and welcome to the KZ world! I was wondering if you could help me. 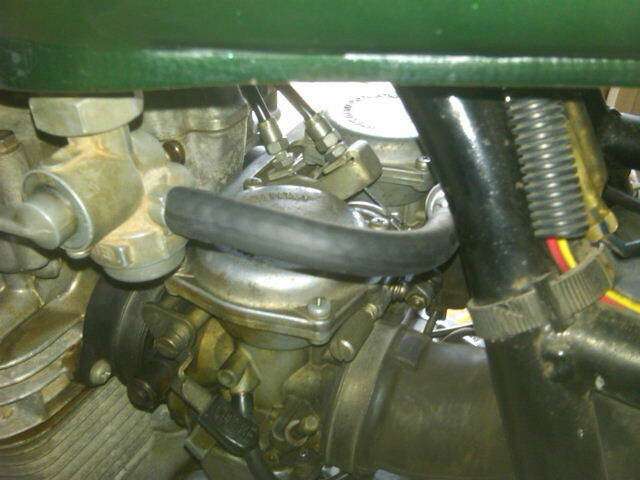 My kz750b was running great then all of a sudden started puking fuel out the vent tube on the right carb . Ive tried everything. I adjusted the float both up and down, still the same, I replaced the float needle and seat, no change. What did I miss ? Any ideas? Thanks for any and all help. I need to know if the “puking fuel” occurs while running or parked. Or both. Either way, given what you’ve changed, here’s my quick thoughts.. When fuel comes out of the overflow tubes, it means that the fuel is flowing un-regulated. This usually means the petcock seal is not sealing off the tank flow, and/or the float needle is not seating in the float jet for a clear seal. If the problem is happening while parked, it could be a few different reasons, especially if it hasn’t run for a while. This has happened to me for two reasons: 1.) the petcock was not touching fuel as the tank was stored for winter, and every spring the petcock valve needs to “re-expand” after making contact with fuel for a few days or more. It’s a ritual that in spring there is kitty litter below my bikes for the first days/weeks. 2.) if there’s “grit” in your fuel, either from sand in the air, or rust in your tank, that may be too fine for you to see or really feel. You need to run brass-element inline fuel filters to make sure that nearly-invisible grit doesn’t get in your lines and stop the float needle and jet from mating up.